In order to get a good impression of the cultural change of Java in the 16th century, we will examine the mosque of Kudus. Kudus is located at the North coast of Java, it is the only place in Java that is named after a holy place in the Middle East, namely ‘al-Quds’ – the Arabic name for Jerusalem. The mosque of Kudus looks very Javanese. An inscription in the prayer room provides some historical information from which scientists have concluded that the mosque was built in the 16th century. The minaret resembles some of the characteristic features as can be found in Javanese and Balinese Hindu temple art. 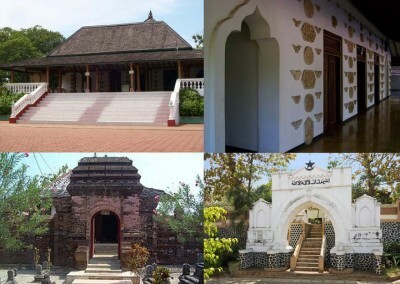 The mosque’s outside wall is incorporated by a split gateway (candi bentar), as often found in Old-Javanese architecture. Then there is another inscription, which is found in the early mosque at Mantingan. The prayer room of this moque is built in 1559-1560. Here, too, a combination of Islamic and pre-Islamic features is found, in this case the Indian Saka calendar is depicted, similar to the tombstones at Tralaya and Trawulan. De Graaf and Pigeaud think that the square construction form of the mosque, along with its roof made of several layers of roof tiles, support the evidence for their assumption on the architectural style, which they believe, derived from the Chinese pagoda. This is, however, only a hypothesis on the origin of the architectural style of the mosque in Indonesia. 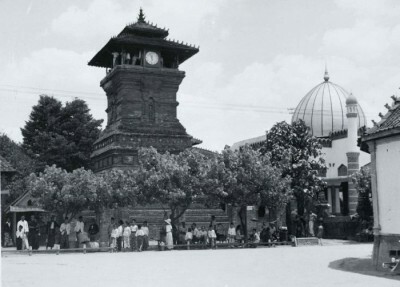 But, if De Graaf and Pigeaud are right, then, the architecture of Javanese mosques reflects the socio-cultural circumstances of the time as described by Pires; Javanese from pre-Islamic traditions became Muslim, while, at the same time, foreign Muslims became Javanese. Ricklefs, M.C., 2006: ‘Mystic Synthesis in Java: a History of Islamization from the Fourteenth to the Early Nineteenth Centuries‘; p. 26. Ricklefs, M.C., 2006: ‘Mystic Synthesis in Java: a History of Islamization from the Fourteenth to the Early Nineteenth Centuries‘; p. 27.